Beyond just being a customer service platform, Zendesk Support is also a place where you can go to learn about your customers and engage with them in a way that’s more meaningful, personal, and productive. One of the ways Zendesk Support enables companies to draw out customer insights is through our NPS surveys. NPS is essentially a metric that measures customer loyalty with your brand. Through a one-question survey that asks “How likely are you to recommend Acme Company to someone you know?”, you can measure customer sentiment and gather valuable feedback about your company, products, and service. While you can send NPS surveys within the Zendesk Support web interface, you can also tap into our API to automatically send these surveys based off of an event that occurs in your product or service. For example, many retailers often choose to send an NPS survey to a customer after an order has been fulfilled in order to capture a customer’s feedback about his or her entire experience with the brand at the most opportune time. 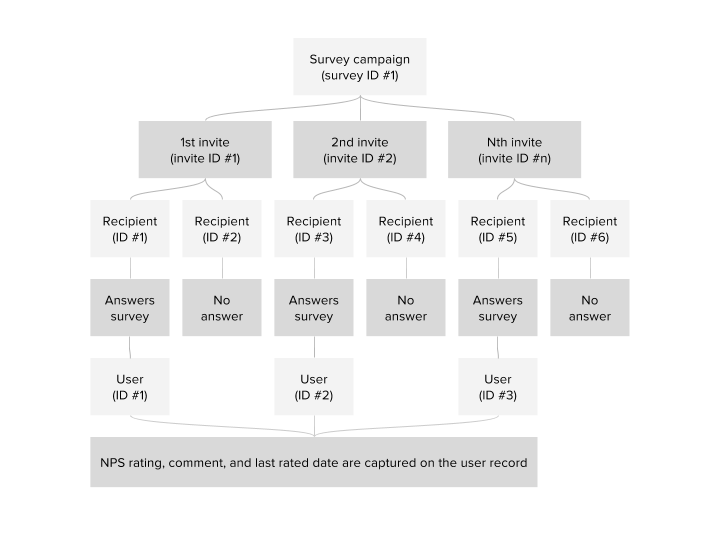 Via the NPS API, you can define the recipients of an NPS survey campaign, when they are offered the survey, and export the survey results for reporting and analysis. See the Core API documentation for general information on Zendesk APIs, such as authentication, rate limits, and pagination. Every NPS survey campaign has a unique survey ID. Under each survey campaign, there can be multiple invitations—each represented by unique invitation IDs. You can send invitations to one or multiple recipients to take an NPS survey. If a survey is delivered successfully (e.g. no bounce), the NPS survey is emailed to a recipient, who is represented by a unique recipient ID. If the recipient responds to the survey, the recipient will then become a user in Zendesk Support if he or she did not exist before. The user will have a unique ID, and the user’s NPS rating and comment will be captured. Copy/paste the survey ID and use this ID in the API when creating a new invitation. Net Promoter, NPS, and the NPS-related emoticons are registered trademarks, and Net Promoter Score and Net Promoter System are service marks, of Bain & Company, Inc., Satmetrix Systems, Inc. and Fred Reichheld.